ANN ARBOR — Jim Harbaugh was coaching the San Diego Toreros the last time Michigan won a true road game against a ranked team. Yeah, that was a long time ago. The 14th-ranked Wolverines have an opportunity to stop their 12-year skid on Saturday night at No. 12 Notre Dame. “We’re a better team than last year and we just can’t wait to prove it,” Michigan safety Tyree Kinnel said Monday. Harbaugh and his players haven’t had a lot to do with Michigan’s 0-16 road mark against Top 25 teams since beating the second-ranked Fighting Irish 47-21 on Sept. 16, 2006. 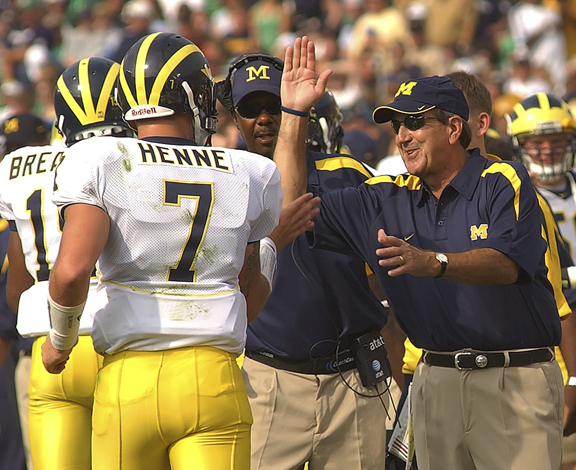 The streak started under former coach Lloyd Carr and rolled on with Rich Rodriguez, Brady Hoke and Harbaugh on the sideline for college football’s winningest program. Michigan hasn’t been able to win many big games, especially away from the Big House, over the last three years under Harbaugh. Michigan was 0-2 on the road against ranked teams last year, losing by 29 points at Penn State and by two touchdowns at Wisconsin. The Wolverines were close to stopping the streak in 2016, only to lose by three points in double overtime at Ohio State. In Harbaugh’s first season at Michigan, he didn’t face a ranked team on its field. This week’s opener will not be the Wolverines’ only chance to win a road game against a ranked team, with matchups coming up at No. 11 Michigan State and No. 5 Ohio State. Northwestern, which received 13 votes in The Associated Press preseason college football poll, also may be ranked by the time it hosts Michigan in a month. Harbaugh, though, has won only one of six games against the Buckeyes and Spartans, and he’ll face both rivals on the road this year. Setbacks to those teams have led to Michigan finishing third in consecutive seasons in the Big Ten’s East Division before slipping to fourth last season. And those lackluster showings in the standings have overshadowed 28 victories over the last three years. The Wolverines will have to account for the loss of receiver Tarik Black if they want to sing their fight song in the locker room, as they do after wins, late Saturday night at Notre Dame. Harbaugh said Black will be out for weeks with a broken right foot, insisting it has not been determined whether Black needs surgery even though he had a similar injury last year that required surgery. He was hurt during practice Saturday. He had 11 receptions for 149 yards and a touchdown in three games last season before needing surgery on his left foot.